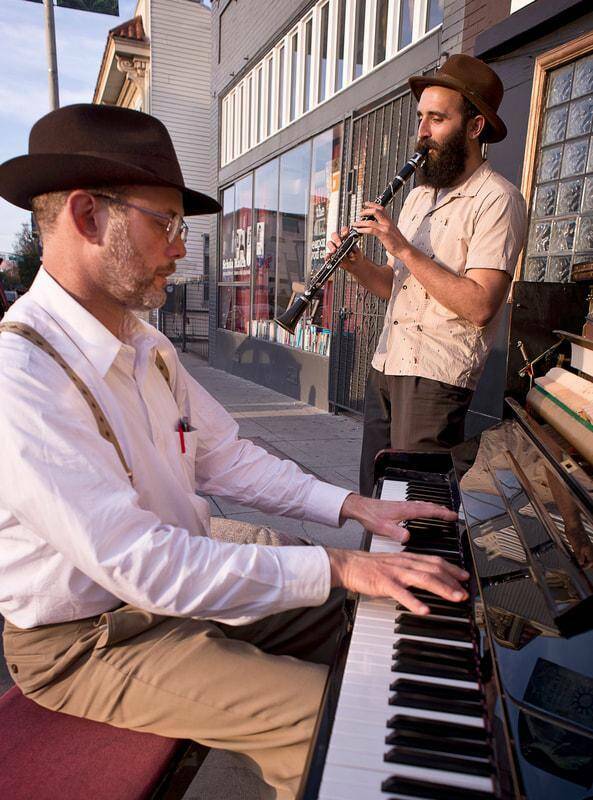 The West Coast traditional jazz scene has been gaining steam recently with phenomenal new bands stepping up as many from a previous generation retire. I’m not talking about young spasm bands knocking around, these are adult musicians, some with decades of playing under their belt. 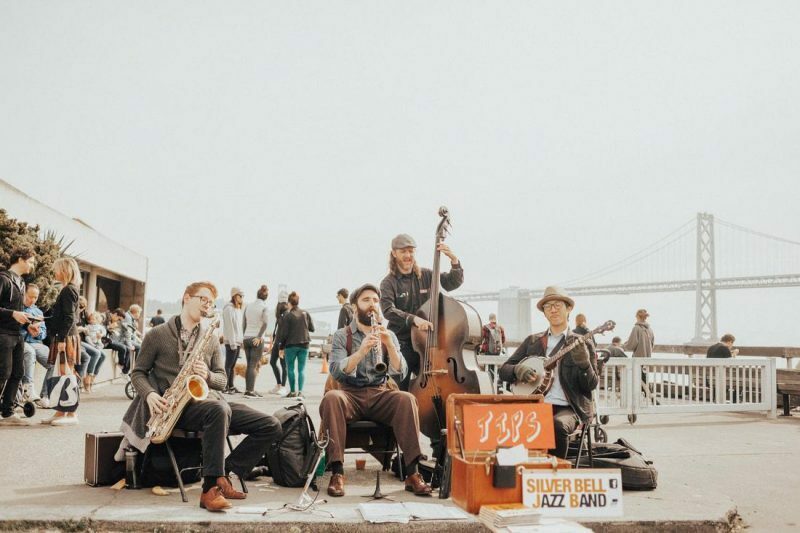 Among the most exciting is the Silver Bell Jazz Band of San Francisco. The Silver Bells were recently organized by Ryan Calloway who in addition to being a professional dance instructor and visual artist plays clarinet for several bands. 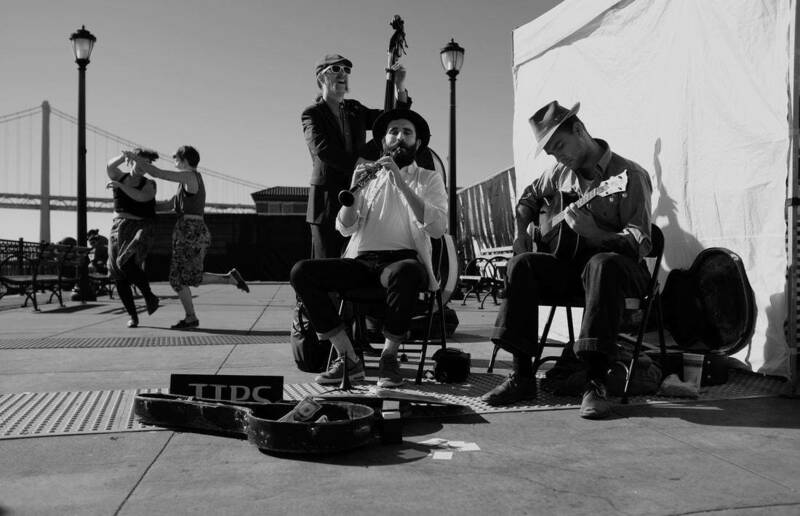 His swing-oriented band, the Hot Baked Goods, has a popular gig at Amnesia in San Francisco and plays Lindy Hop events all over. This March found them at Swingbreak in Mexico. The bluesy feel is prominent on their self titled studio album released last April. The album features New Orleans guitarist James McClaskey who with his Rhythm Band of Nola trad players has just released an incredible album of swing fueled rhythm and blues. For the Silver Bells he picks up the banjo as well as the guitar and his amazing vocals truly need to be heard. He would not be out of place in a duet with Memphis Minnie. Those vocals convince on tracks like “Organ Grinder Blues”, “You Rascal You”, “Trouble in Mind”, and “Windin’ Boy Blues”. Hot instrumental tracks include “That Da Da Strain”, “Dippermouth Blues” and George Lewis’s “St Philip Street Breakdown”. It is the revival sound of the New Orleans transplants, particularly Bunk Johnson’s band, that they seem to be channeling. This small band consists of Calloway clarinet and washboard, Samuel Wolfe Rocha on cornet, McClaskey guitar or banjo, and James “lil jimmy” Touzel bass, with Baker jumping in on cornet, trombone, or sax. This is high energy music played in concert with the dancers on the floor. Baker plays a mean trombone, and Calloway is not worn thin by all his creative extracurriculars, his clarinet and sax playing truly lead the band. The heavy beat of Jelly Roll Morton’s “New Orleans Bump” gets the blood pumping early in the album. It’s an excellent track for choreography, even listening to the CD I could picture the dancers. Overall the album has more of a West Coast revival sound. The bright and tight presentation of “I’ll see you in my Dreams” will please fans of any generation. Other stalwarts include “That’s a Plenty and “Tiger Rag”. Deeper into the set the blues feeling of the studio album returns, along with some growl and a slower shuffle for the dancers. The dip from a lively “Oriental Man” into “Perdido St. Blues”, and “The Mooche” before lifting the tone again is great programming. They do an excellent job of keeping a long set interesting. Vocals are less prominent on this record, appearing only where necessary as on the title track’s “Stick out your can, here comes the garbage man”. Calloway is no McClaskey but his vocal on “Someday Sweetheart” is promising, as was his vocal on “Blue Drag” on the first album, and he could sing more frequently. Of 15 worthy tracks, “Sobbin’ Blues” best captures the feel of the album, combining well the two ponds of revival jazz they swim in. Plus, as I’ve mentioned before, I have a soft spot for the tuba taking the lead. Riley Barker has some power in those lungs, especially on “Candy Lips” and “Canal St. Blues”. There is a whole lot of tuba on this album! He also drums for hot baked goods so his life is steeped in rhythm. I know there was a delay in getting the album out as they processed the live audio. The result is worth the wait. There is little interference from crowd noise and you only really sense the crowd at the intros and on “Whenever You’re Lonesome” during extended piano passages. This is a heck of a set. Expect to see The Silver Bell Jazz Band at a festival near you.